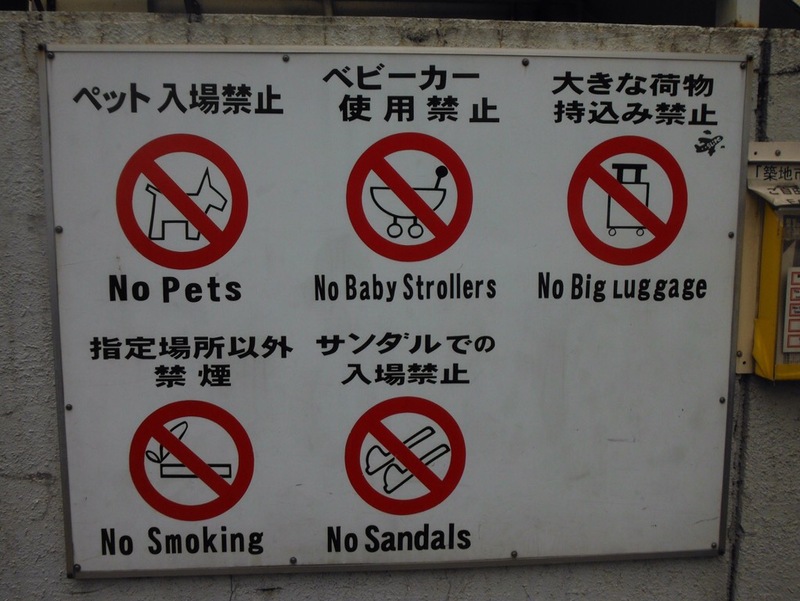 Landing in Tokyo was quite the culture shock. The beauty of travelling by bike is that the scenery/culture/people/weather changes gradually as you move across countries or continents, so nothing is ever that big a shock. Sit on a plane for twelve hours however and you can suddenly find yourself somewhere totally different to where you last went to sleep. I (Jo) usually hate flying, but in fact it was a welcome respite from the stress of getting the boxed bikes and ourselves to the airport and planning how to do the opposite when we landed in Tokyo. 12 hours where I could relax, sit still, and not have to make any decision other than whether to watch Finding Dory first or play Tetris. In fact the first thing we did was watch Bake Off, which we usually like to do with either a cake or if not, an alternative dessert item. 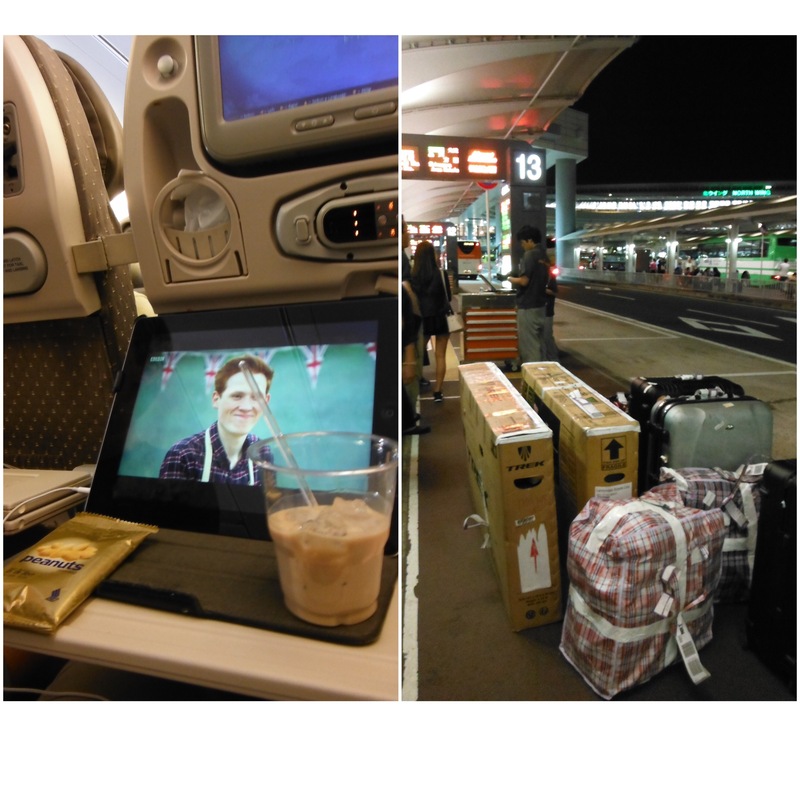 As neither of these options were available straight after take off we settled for a Baileys. Rock and roll. Our flight was an hour late landing which meant that the last bus we could catch into the city left fifty minutes from the time we unbuckled our seat belts on the plane. Japan has a reputation for efficiency but surely this is not enough to get disembark, clear immigration, collect our bags, find and collect the boxed bikes, clear customs, find the bus stop, buy the right bus ticket…. but sure enough, 45 minutes after landing we were stood in the bus queue, tickets in hand. This has to be a record. There was even time for a first Japanese toilet bum-washing experience (more on that later). We made it to our hosts and somehow it was Thursday night already. A day had disappeared. 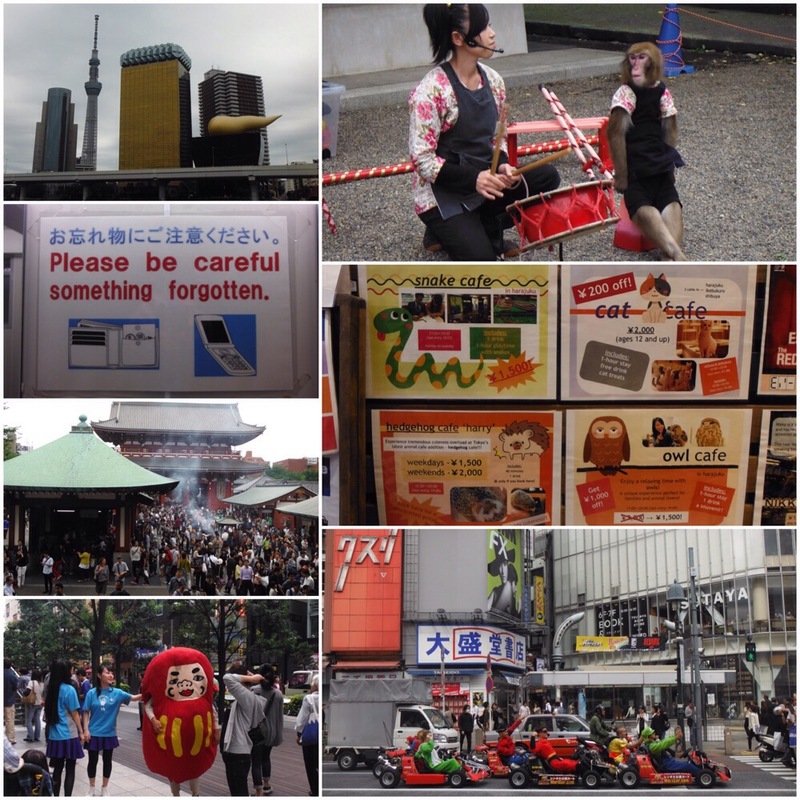 We had five days in Tokyo, and most of these were spent wandering around wondering what on earth was going on. 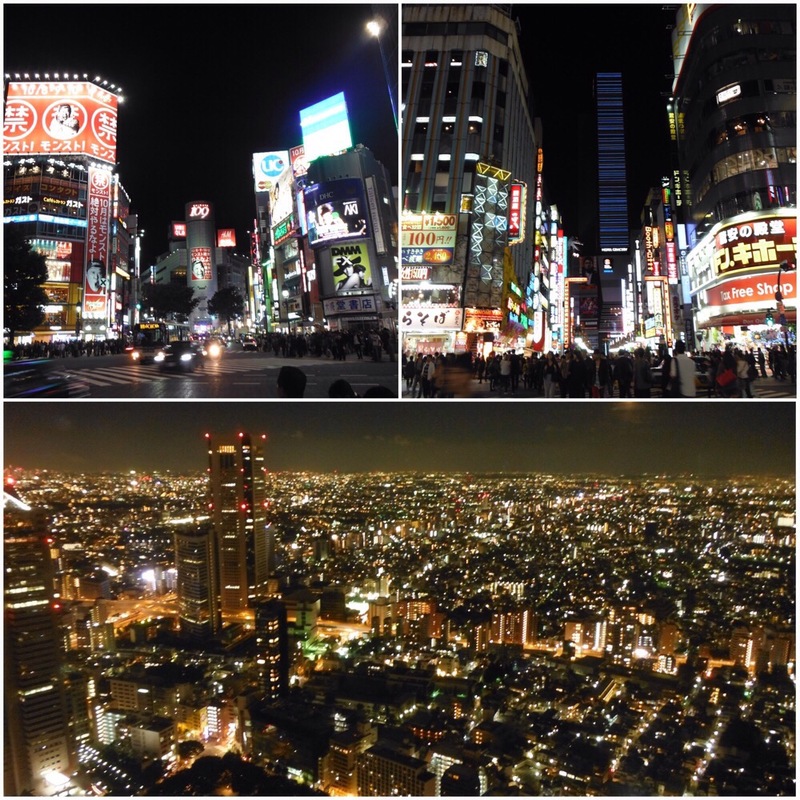 Walking through Shinjuku and Shibuya at night was exactly how Tokyo looked in my head – neon lights, flashing billboards, lots of noise, traffic and people. Yet a couple of subway stops away you can walk through tiny, quiet residential streets and feel a million miles away from the craziness. We went to supermarkets and stared at shelf upon shelf of things that we didn’t have a clue what they were. A bit more transparent packaging would help foreigners try to work out what’s inside. One lunchtime we ordered food from a ticket machine outside a restaurant, took the ticket inside, then two minutes later collected our food. We cycled around gazing at all the symbols on road signs wondering how we were going to navigate our way out of the city. The search for a decent road map in English that wasn’t a million pounds proved fruitless. One morning we went to Senso-Ji temple, which was so busy with tourists (almost all Japanese) that there was no sense of peace at all. Wandering round to one of the smaller shrines on the same complex we saw there was a wedding, and the whole family were posing for photos taken by tourists they had never met. Strange, but not as strange as the fact that directly opposite this wedding was a girl and a monkey dressed in exactly the same outfits. On the opposite side of the river was the Asahi building that looks like a beer. A group of people drove past us in go karts wearing Mario Kart outfits. Everywhere you look there is something crazy going on. 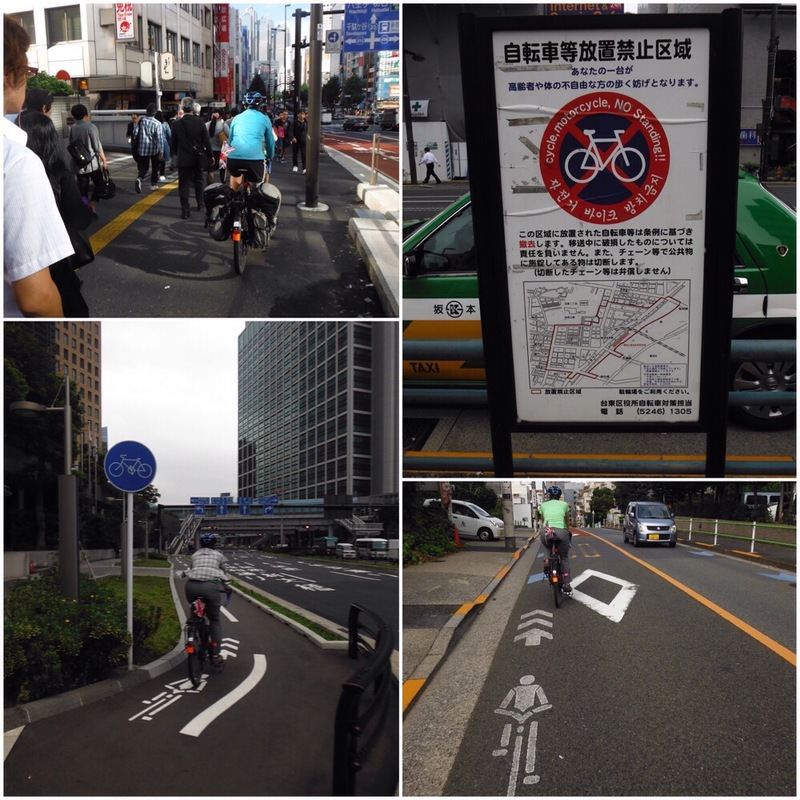 Tokyo is a fairly cycling-friendly city. There aren’t so many bike lanes but most pavements (sidewalks to our American friends) are designated shared use, and if they’re not, people cycle on them anyway. In fact we soon noticed that it was only us and the cycle couriers bothering to ride in the road. And wear a helmet. The infrastructure might not quite be there but the culture of cycling reminded us of Northern Europe – people of all ages riding town bikes with baskets in their normal clothes. Mums riding with kids on the front/back, boys in track suits riding to sports practices with their kit bag in their basket. No lycra, no helmets, just functional riding. It’s a fairly densly populated city so weaving in and out of all the pedestrians on the path takes some skill, and doing it one handed whilst carrying an umbrella takes even more. It was all a bit advanced for us so we took our chances with the road traffic. All of this makes Tokyo a good place to explore by bike. Until you actually want to get off. We realised pretty quickly that if you don’t have a stand, your chances of finding somewhere to leave your bike drop dramatically. There’s bicycle parking places everywhere, but they are just that – a space in a car park with a bicycle painted on the floor. No posts. No use to us stand-less foreigners. There’s also certain streets where you are not allowed to leave bikes, and if you do they are likely to be ticketed or removed (we saw both happen). There may or may not be a sign informing you of this. 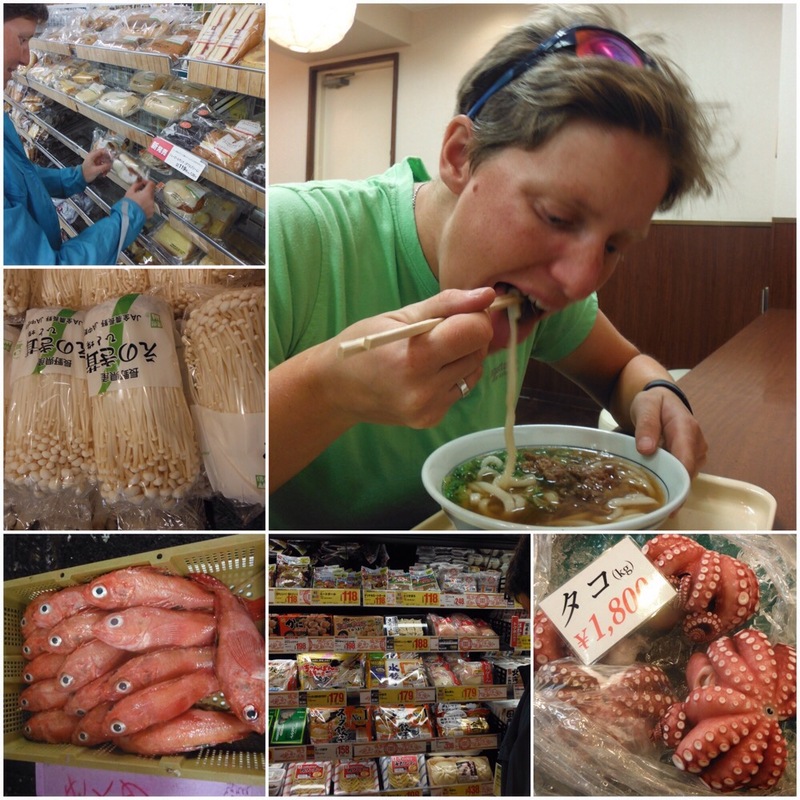 Our first brush with Japanese police was when we visited the famous Tsukiji fish market and tried to park our bikes outside. No! 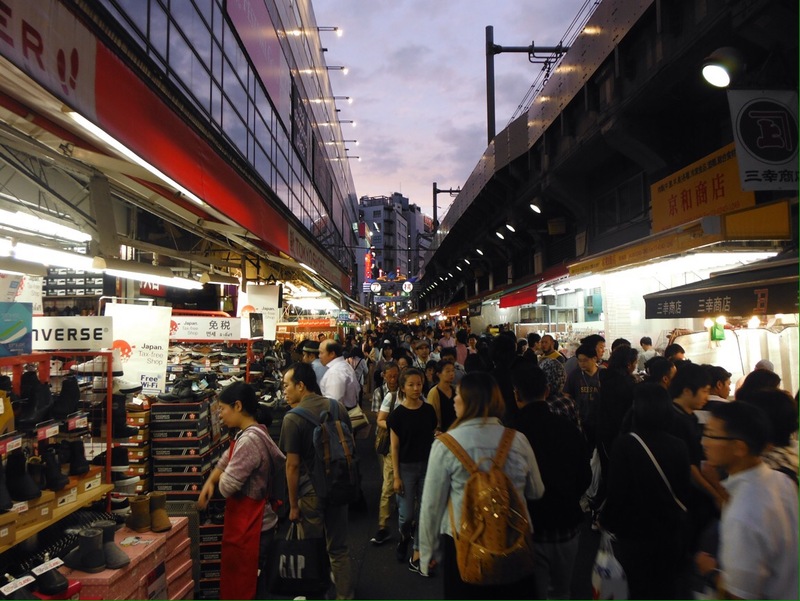 (Despite these teething problems the market was quite the experience. 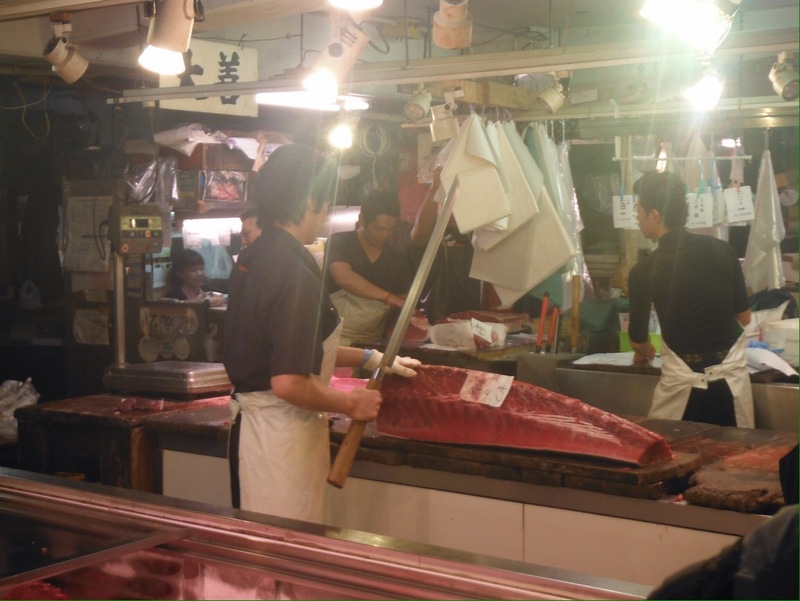 More things we didn’t recognise; men chopping fish with swords; fish heads everywhere). It is fascinating which rules/laws are obeyed to the letter and which are more flexible. Japanese cyclists also don’t seem too worry too much about cycling on the wrong side of the road, or riding through red lights. We are yet to see anyone local cross an empty road whilst the red man is still on though. 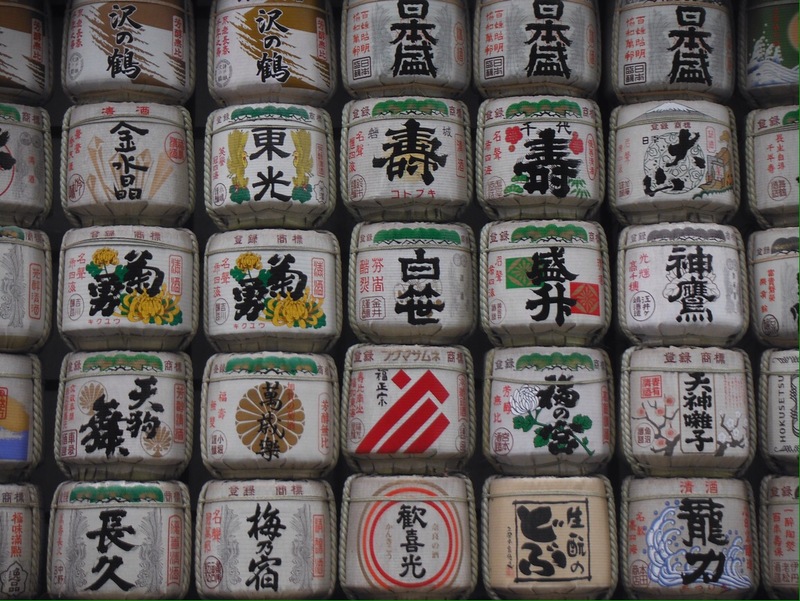 A walking tour around Ueno park was a good introduction to Japanese culture. An old guy (the ageing population over here is very obvious) walked us around for a couple of hours and explained a few key things. 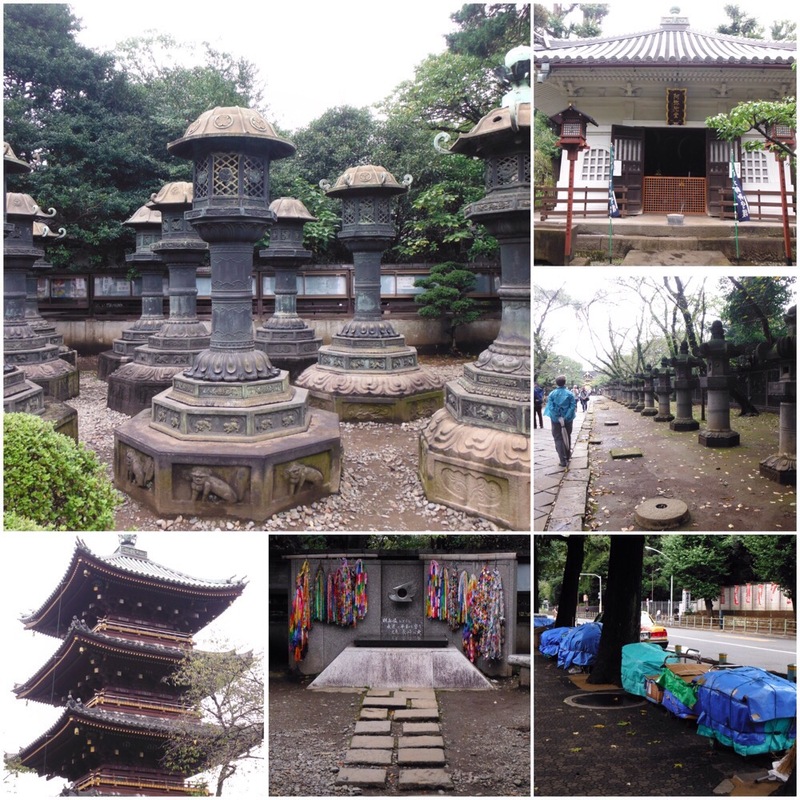 We learnt the difference between Buddhist temples and Shinto shrines; how Japan has prominent, random statues of people who once visited to dubious benefit of the country; that homeless people who live in the park tidy their possessions up into a cube shape wrapped in tarpaulin during the day and leave them neatly lined up on the path; and that there is a street in the city devoted entirely to producing and selling the frighteningly accurate plastic replica meals you see in restaurant windows. Armed with this information we felt more ready to take on this weird and wonderful country. Our final day was mostly spent at the British School in Tokyo talking about our trip with primary and then secondary students. This was a lot of fun, and the older students had their own budget to plan a trip at the end of the school year so it was good to answer their questions. Mark increased our knowledge of Japanese law intricacies by informing us that crime is so low that he leaves his iPhone lying around unattended with no trouble but umbrella theft is rife. In between the sessions we rode to Meiji Shrine, struggled to find somewhere to lean our bikes in the bike parking area and were told off for eating a banana outside the park. Later that day Debs picked up a green basket at the supermarket from near the checkout only to have it swiftly snatched from her and replaced with a red one. We still had a lot to learn. Thanks to Richard and family; Mark and everyone at BST. 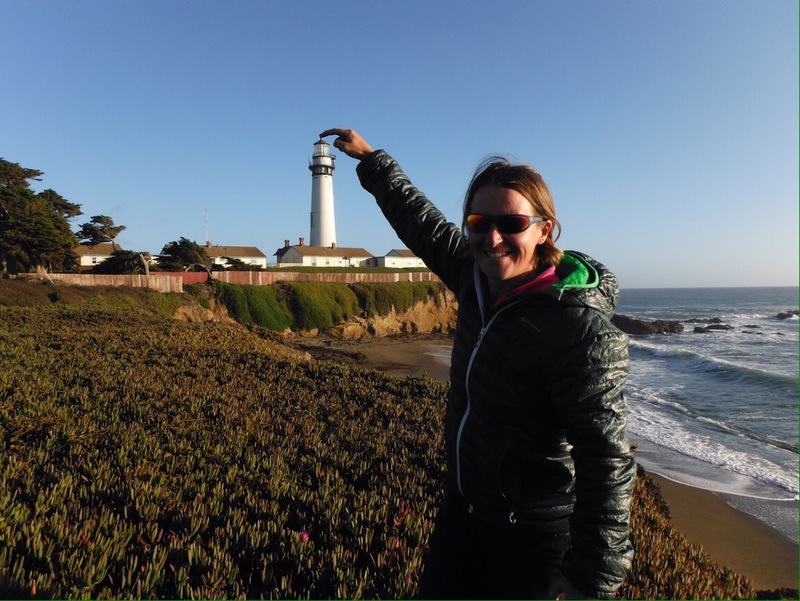 Jo is a big fan of lighthouses, and had been pleased to learn that there are two hostels in light-keepers’ quarters south of San Francisco. After a twisty descent, the last ten miles to Pigeon Point were along a beautiful stretch of coastline. The wind switched to the North and we zoomed along past beaches and rocky headlands. We were very excited to find an extremely comfortable sofa in the hostel (small things) and even more so to find out that the hostel manager is a stargazing enthusiast and would be setting his telescope up that evening. If you have never had the opportunity to look at stars like that, seek one out. Ideally somewhere with a dark sky, a proper telescope and a person who knows a bit about it. We had all three. I have seen Saturn before, but it was no less wow-ing a second time, it looks like someone has drawn a cartoon planet with ring and stuck it on the end of the telescope. We also looked at some globular clusters (not a breakfast cereal for Star Trek fans), a galaxy that’s like ours, and Jeff used a super cool laser pointer to show us some constellations that we instantly forgot. Amazing. A lazy morning and a speedy wind-assisted afternoon ride took us to Santa Cruz (you’re not that far). We spent most of the ride working out who sang that song. We were sure it started with a ‘The’. Two days later we got it. I won’t spoil the game for noughties music fans. Santa Cruz is a trendy town with a LOT of surfers. We took our cereal and milk down to the sea front to watch the action. I’m afraid that’s all the space it gets in this post though as nearby Carmel steals the show. Not because it is super fancy and historic, but because Carmel law states that a permit is required for high heels and you can actually get a permit from the town hall. Amazing. Sadly it is closed on Saturdays, so Jo was unable to don her stilettos for the ride. We settled for an apple fritter from Safeway instead. South of Carmel the riding was fantastic. 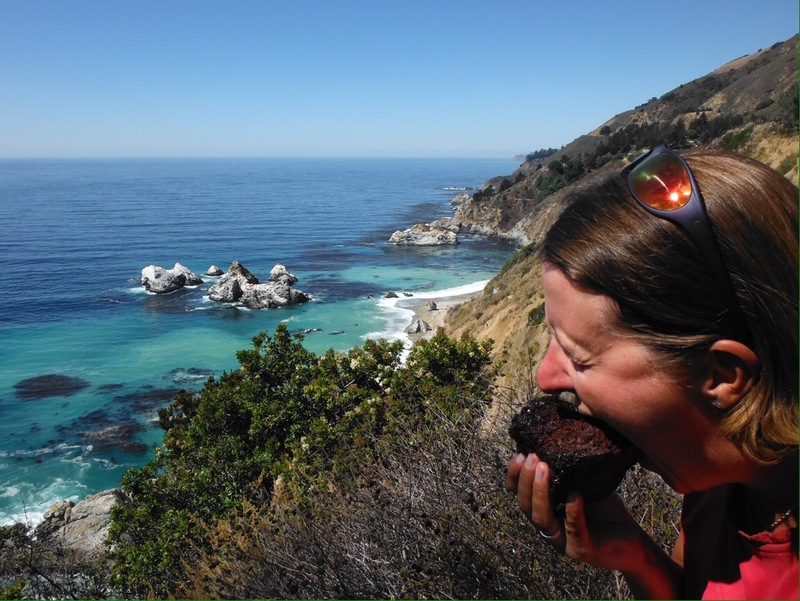 More weekend traffic than we would have liked, but stunning scenery through the Big Sur area. Huge forest fires nearby meant that state park campgrounds were housing firefighters, so we shared a pitch in a private campground with fellow cyclists Greg and Pete. We were next door to some lovely families on a weekend trip, and were very well fed with barbecued meat, refried beans, salad, beer and chocolate cake. Much more interesting than our usual pasta. It was a fun Saturday night and the amazing scenery continued for the next few days. We saw sea lions and funny looking elephant seals. 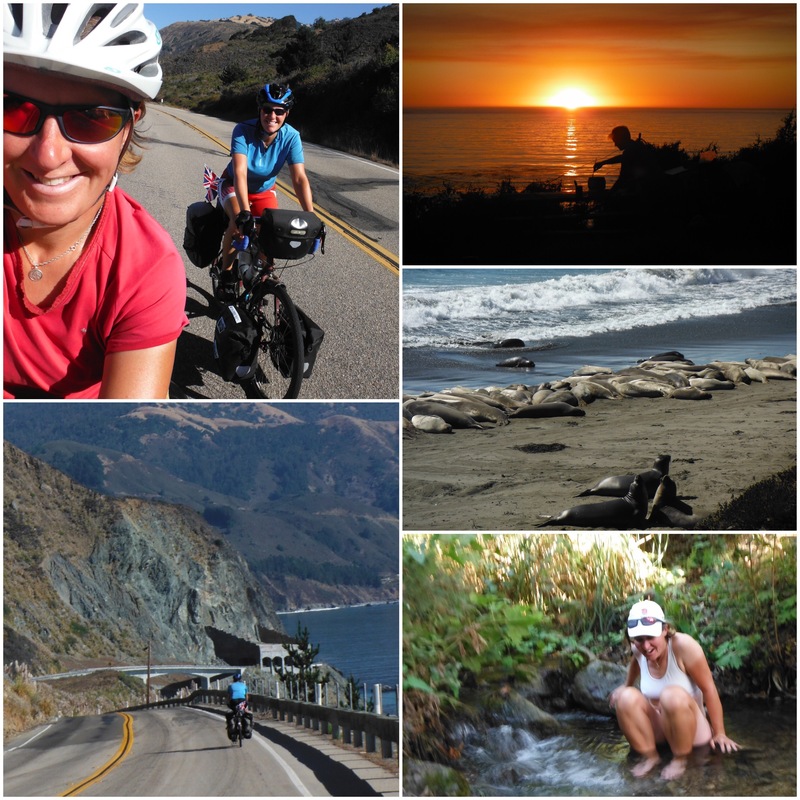 We had possibly the best cycling of the USA, one of the best camp spots (Kirk Creek Forest Service), a few outdoor washes (a creek one night, the ocean the next) and only one more night of raccoon vandalism. 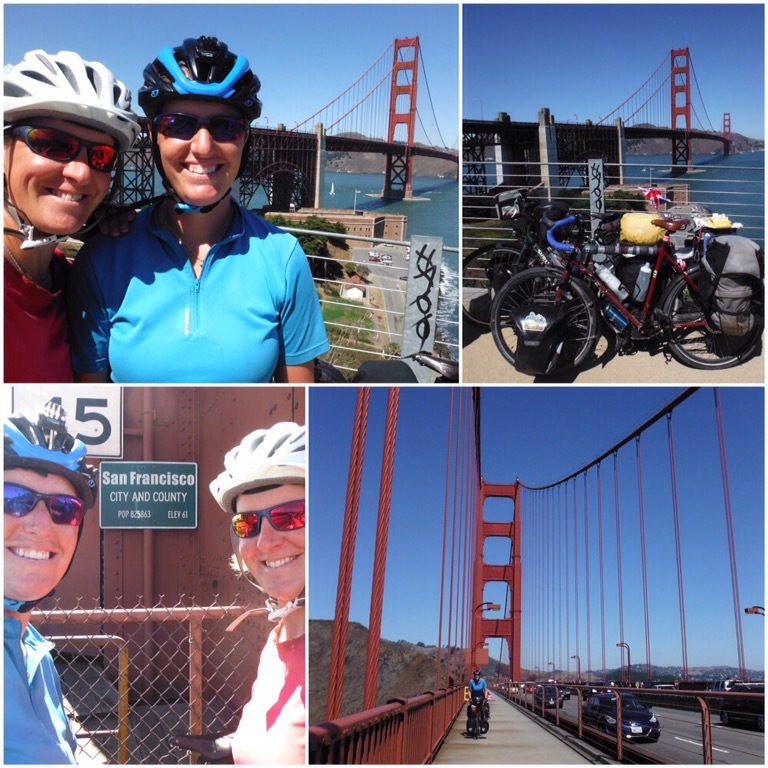 Carmel to Morro Bay: Possibly the best riding of the whole US. 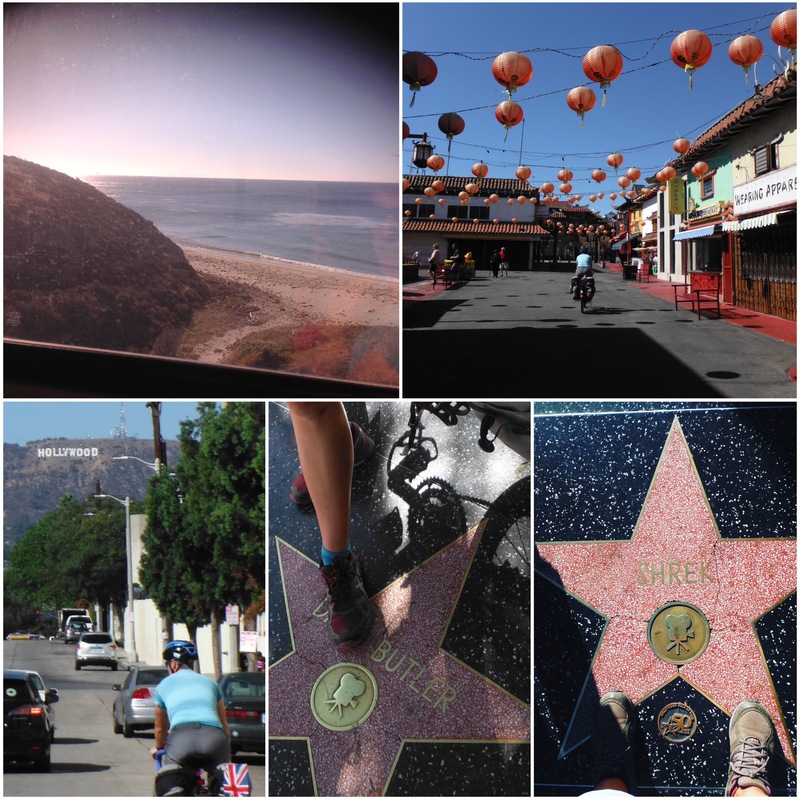 We had been undecided about whether San Luis Obispo or LA would mark the end of our North America ride. As we sat by the sea in Morro Bay eating our first fish and chips since the San Juan Islands I became pretty sure I wanted these great days to be the end of the ride, not a busy dual carriageway into a city. This was cemented when our lovely host in SLO Rod told us about the train journey between the two. The train goes right along the ocean for a long stretch where the road is inland. We had a winner, and the end point of our 6500+ mile cycle. Whilst waiting for our pancake treat there was time for a fabulous All-American Friday night at the local high school football game. It was just like a movie or TV show. Everyone stood for the anthem. There really were cheerleaders. There was a marching band. And a giant inflatable tiger. There were even more people involved in the overall show than there are on an American football team and lots of students and parents had come to watch. It was a magical experience. 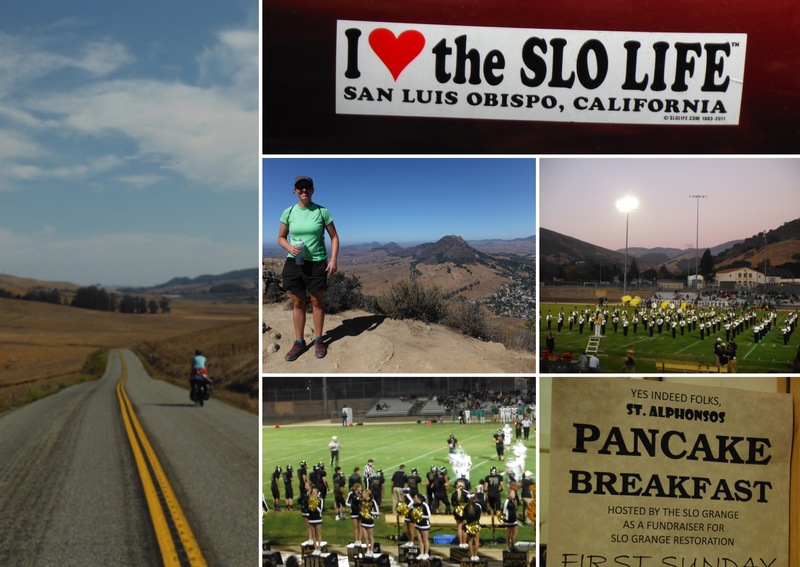 Pancake breakfast was also totally fabulous, and we were sad to say goodbye to SLO early on Monday morning. The train journey was spectacular and gave us a hassle-free arrival into central LA. We had a few tasks to complete before our flight, beginning with locating some Chinese shopping bags to check our panniers in. We had tried to get some in SLO, they are pretty ubiquitous (we got the last ones in Hinckley) but no one seemed to know what we meant. We started showing photos, which drew the comment “They’re a bit ethnic. I don’t know if you’ve noticed, but it’s not very ethnic here.” Anyway, we thought Chinatown in LA would be a safe bet, and we had our very own ‘The Apprentice Shopping Task’ moment as we cycled around the streets: “I’ve seen them, turn round!” Lord Sugar would have been disappointed that we did not negotiate and paid the full price of $5 for two bags. A poem for your dog: Roses are grey, violets are grey. Neutering your pet makes them less nuts. Your pets will love us, I shitszu not. Thanks to: The All-American Veterinary Sign Writers’ Association (if it doesn’t exist, it should, people need recognition for quality work); Ruth & Edward; Jeff at Pigeon Point; Esther; Greg & Pete for great company; Roy, Frank and the rest of the Santa Ana camping crew; Rod, Helen & Casey; Helen’s Bikes, Westwood; Tony & Cathy. Usually there’s not much of a change as you cross state lines in the USA, but California felt different. It looked different. The land was brown rather than green. It was dry out here, and hard to believe that just a few days ago we had been pedalling through heavy rain and fog. At least crossing the state lane provided us with plenty of new tunes for the internal radio. 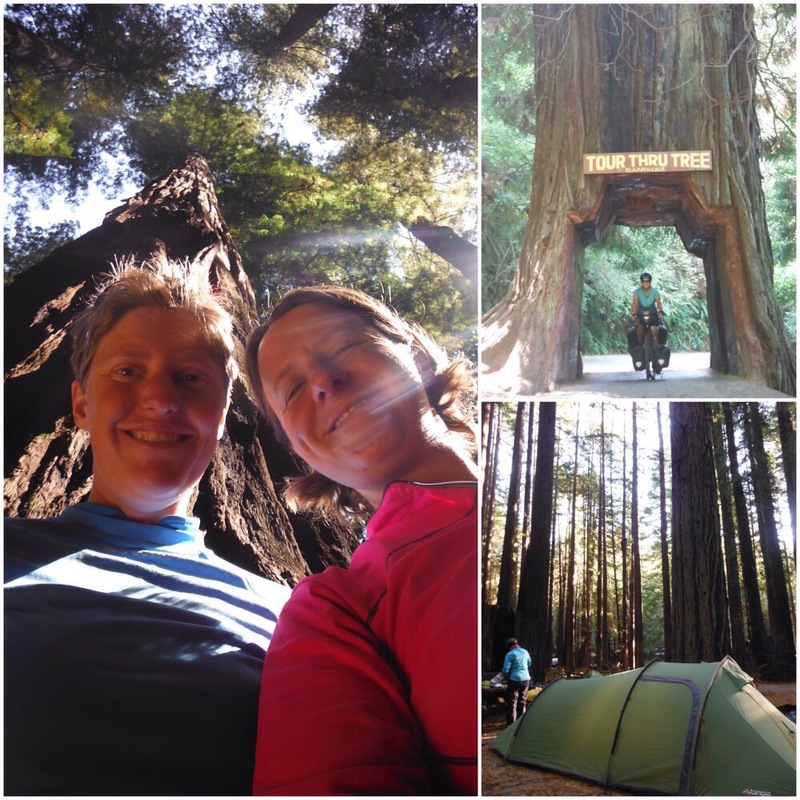 Our first night was spent sleeping in a church in Crescent City, and from there the highway turned inland into one of California’s most famous parks – where there would be plenty of trees – the Redwoods. Redwood trees are tallest trees on earth, and can grow to over 350 feet (over 100m). They can live for over 2000 years. 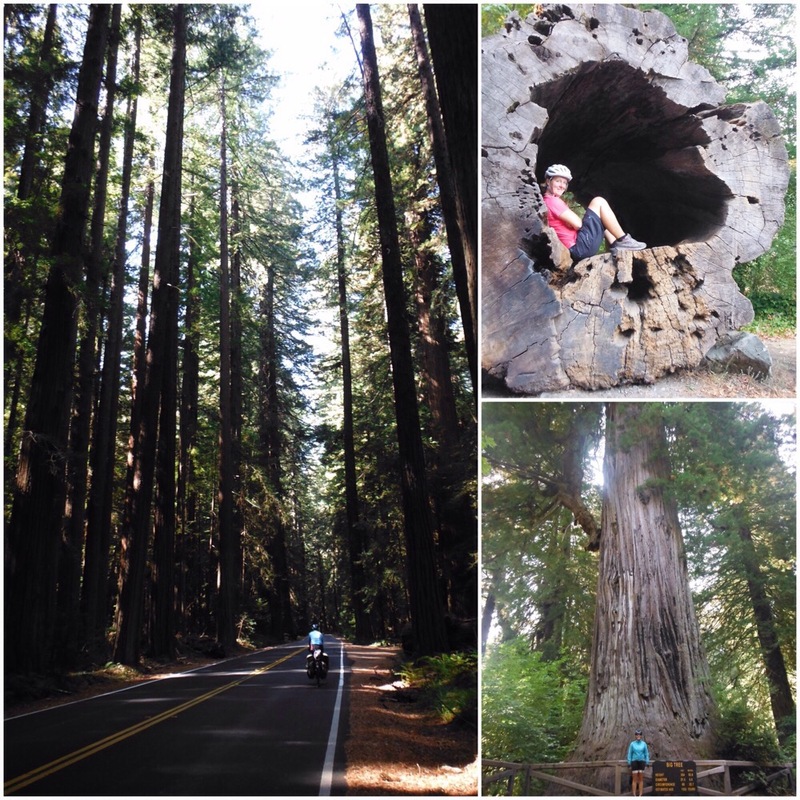 These trees are seriously big – they hurt your neck to look at them while riding. They don’t have low branches, so the trunks seem even taller. The first thing we had to do was ride a big pass, it was hot but the trees provided good shade and kept things cool for us. We met some interesting people that morning. First, at the start of the climb, was a guy who told us with great pride how he had driven all the way from Pennsylvania. Sure, that’s a long way, but when all you have to do is press one pedal at a time (highly unlikely to need a clutch over here) and stay awake, you are not going to impress people who have cycled that far. He also said he loved hugging trees. The second interesting meet was about half way up the climb, we could see a bike ahead with two people stood to the side. When we got closer (slowly, it was steep) we realised it was a tandem, but the two people didn’t look like cyclists. Gradually we could see they had on jeans and backpacks and were smoking. Not your average cycle tourist. They were finding the hill tough. I said “it must be fun downhill though?” to which they replied “I dunno, we haven’t ridden down one yet!” It turned out they had hitched/walked from Missouri (this is a long way, we were impressed this time) and on arrival in Crescent City someone had given them a tandem. So the first thing they had had to do was ride up a huge hill. Bad luck. We said they should probably check the brakes before riding down. They laughed. We repeated this several times, without laughing, and left unsure as whether they knew if the bike even had brakes. Hopefully they survived. On the way down the hill we met a guy riding North (this is very rare) who was carrying everything he owned, including a large knife strapped to his shin. On the the outside of his trousers. Just in case I guess. What was this place?! It is all about the trees in this part of California. The first place we found to stop for water was a complex with three buildings: Trees of Mystery, Forest Cafe, and Motel Trees. We passed the Immortal Tree (survived lightening, fires, etc), Chimney Tree (hole in the top), Grandfather Tree (old), Big Tree (this made us laugh), two Tree Houses, One Log House… Pretty much anything you could wish for, as long as it was a tree. 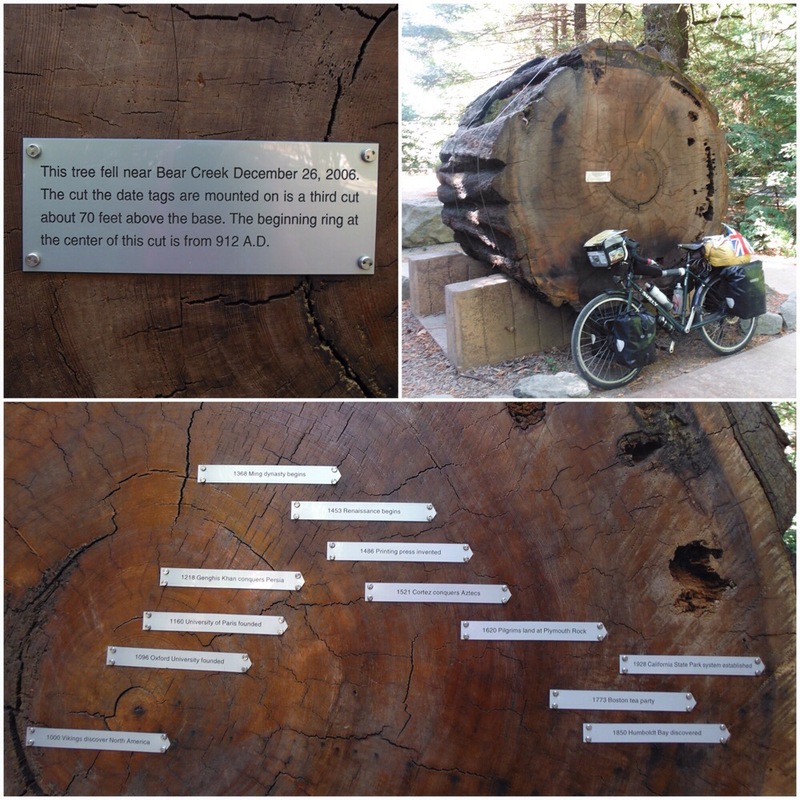 None of these grabbed our attention until we saw signs for the Tour-Thru Tree. We paid our dollar each to the lady in the booth who told us the road up to the tree was steep and she GUARANTEED we would have to push our bikes the last bit. I heard the word CHALLENGE instead, so of course we rode up. 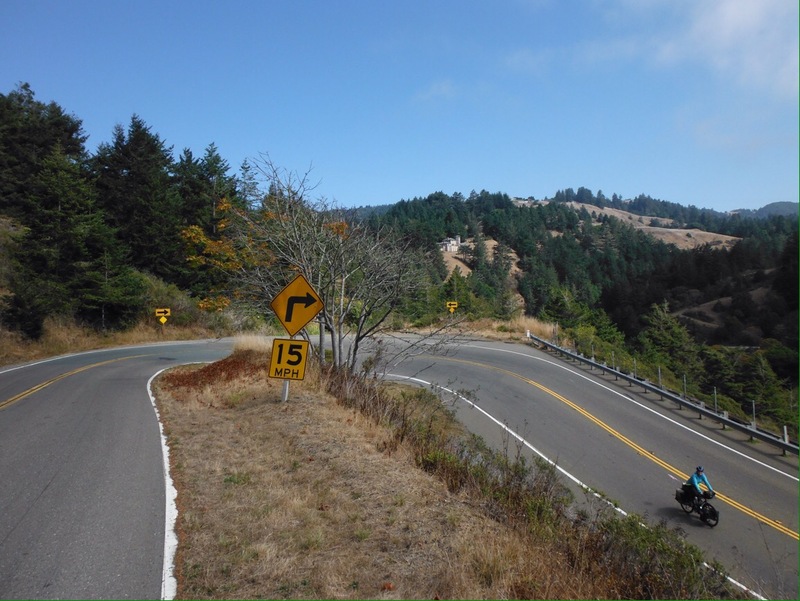 It was steep, but there were no cobbles or gravel – give us a real challenge California. Riding through a tree was fun the first few times, and then it was just as fun watching car drivers try to squeeze their huge vehicles through. We told Ms Cyclist Challenger on the way out that we rode up, did we get a prize etc, and she was very unimpressed. I mean it’s not like we drove there from Pennsylvania. That night we camped at a state park and were the only people in the hiker/biker site that was miles from anywhere else so quite creepy. We set up camp and watched the Great British Bake Off in the tent (like you do) and then came out to find a raccoon had eaten half of our biscuits and chucked the rest all over the floor. Evil. Why would you waste biscuits like that? 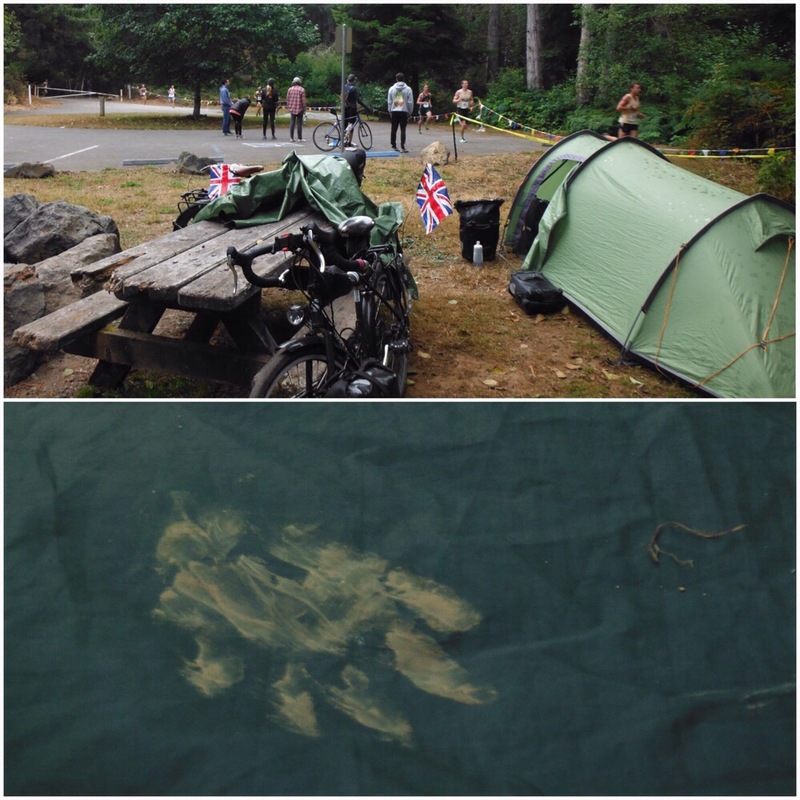 This mindless vandalism continued in the night as I was woken up several times by rustling in the tent porch. Each time, I shone the torch on the raccoon which he did not care for in the slightest, staring back at me whilst trying to pull a non-food bag out of the tent. Other times his partner in crime the skunk would wake me. I say me – Debs remained asleep throughout all of this. In the end the only way I could get them to leave the tent was to throw a shoe at them, which worked four times until I ran out of missiles. I was finally getting a bit of decent sleep until it was broken by shouting outside the tent at 6.40am. A college cross country race was passing right by our camp spot and they HAD to set up that early, using very loud voices despite the obvious sign (a tent) that someone was trying to sleep close by. We only had 25 miles to ride that day but it felt like 100. We were taking up an invitation to stay in Arcata by a family we met in the San Juan Islands. They lived at the top of a huge hill (of course) and on the way up we stopped at a yard sale where some ladies were selling lots of stuff we were not interested in but also had a plate of muffins that we were very interested in. They tried their hardest to offload some books on us and were disappointed to hear that we only wanted muffins, but gave us four anyway as well as a bunch of dried lavender. As we rode off we heard one of them say “look at her leg muscles” and we spent the rest of the ride arguing which one of us they were talking about. Debs has no muscles but was closest to them at the time, so it’s still an unsolved mystery. The 25 miles were completed by early afternoon so we had time for a few hours at the brewery drinking strong local beer in English sized pints. After a rest day in Arcata it was back into the redwoods for a couple of days. The Avenue of the Giants is a scenic drive through trees so close to the edge of the road that you have to be careful not to ride into them. It really is mesmerising riding through the forest, it makes you feel very small. Not just feel small actually, I enjoyed letting Debs ride ahead of me and see how small she looked when dwarfed by the redwoods. We camped in the state park right among the trees and didn’t see much sunlight for a couple of days. After a particularly brutal pass we suddenly popped out on the coast again, blinded by the sun and instantly amazed by how good the coastal scenery was. 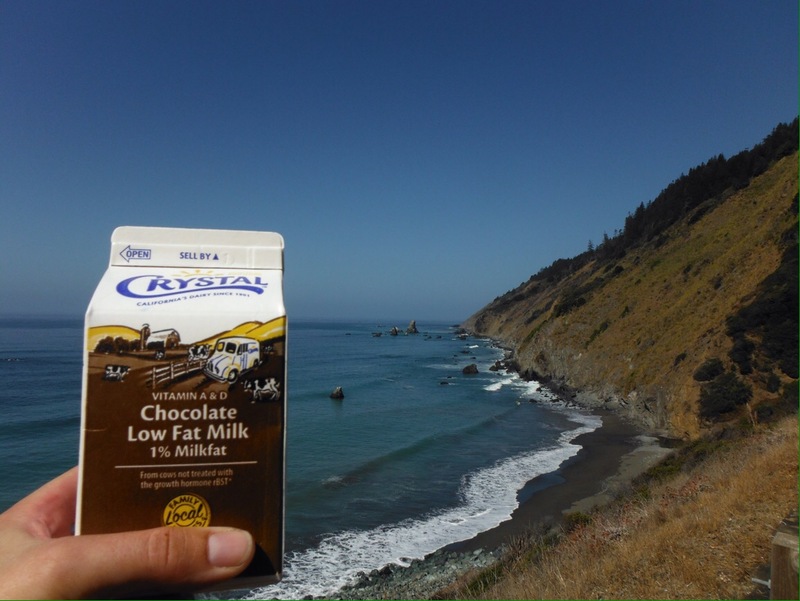 So good we had chocolate milk to celebrate. 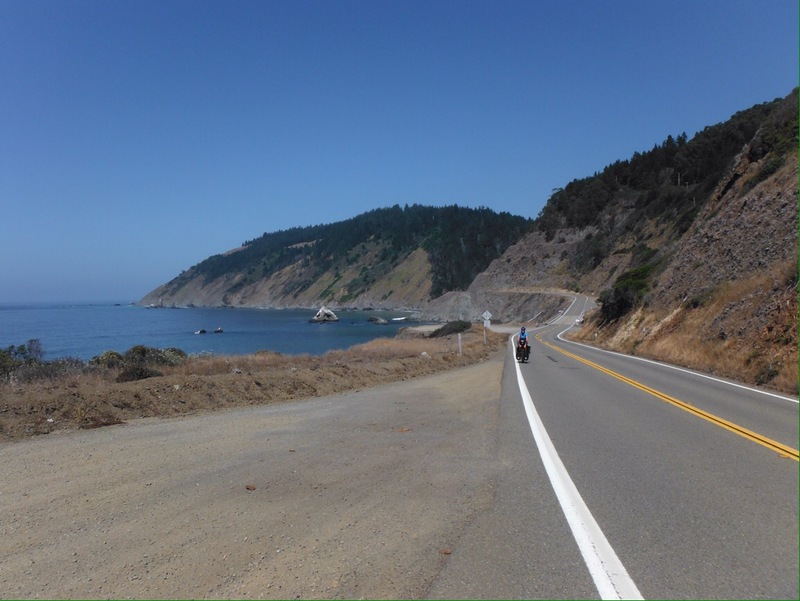 To rejoin the coast we had left highway 101 behind and forked off onto smaller highway 1. This made a big difference in the amount of traffic squeezing past us as the big trucks stuck to the bigger highway and for the next three days to San Francisco we had the best coastal stretch so far. The road climbs and then drops suddenly to get around a gulch (why not just build a bridge over the gap…. anyway) then climbs again, and repeat. Steep up, steep down. One morning there was a fair amount of fog so we didn’t get any rewarding views for the effort, but on the whole the sun shone and the sea sparkled. We called into Glass Beach in Fort Bragg, where industrial waste was dumped into the sea up until the 1960s. A lot of it was cleaned up but the glass and pottery was left and has been broken down and smoothed by the waves so that now the beach is covered with “glass” pebbles. Pretty cool. As we got closer to San Francisco more and more sports cars passed us and the small towns we passed through became more and more posh. This was the California we were expecting. Eventually the Golden Gate Bridge emerged on the horizon. The sky was so blue that it seemed to shine against the background. Reaching the iconic bridge felt more momentous than any of the milestones to this point. It has a bike path down the side so for once we didn’t have to fight traffic for space. Unfortunately being a Sunday we had to fight other cyclists instead. These came from two camps – the roadies trying to race across and weave in and out of the slower traffic, and the tourists on rental bikes trying to ride and take selfies at the same time. And then there was us with our wide loads. I’m not sure whether it’s more difficult to dodge truck wing mirrors or selfie sticks – at least wing mirrors follow a predictable pattern of movement. But we made it across safely and into San Francisco. We sat in Dolores Park, enjoying the view of the city and the people watching. 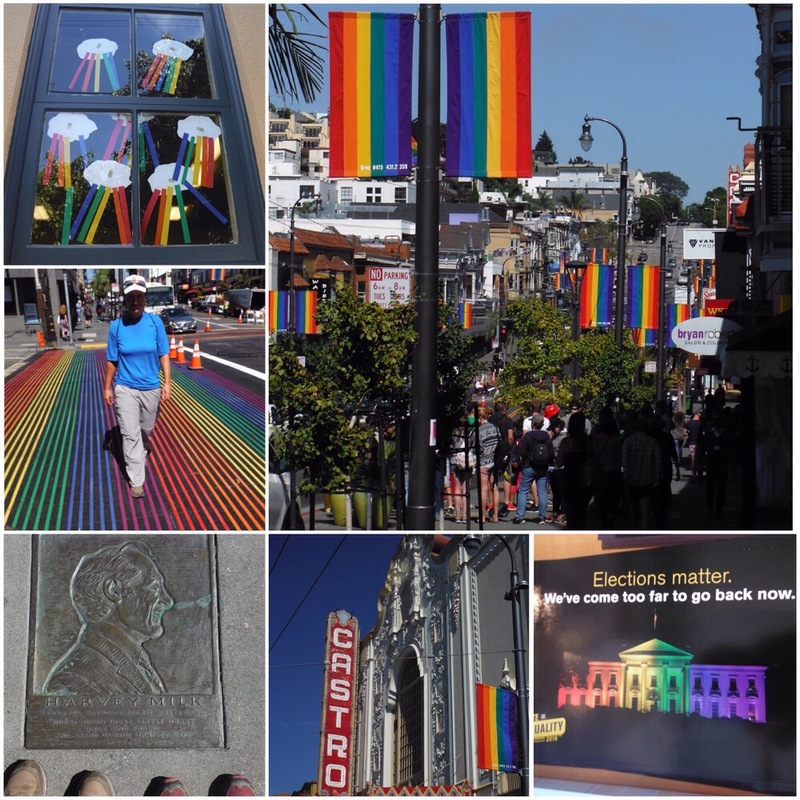 We were close to the Castro neighbourhood, famous for a history of LGBT activism, so joined a walking tour of the area (‘rest day’…). 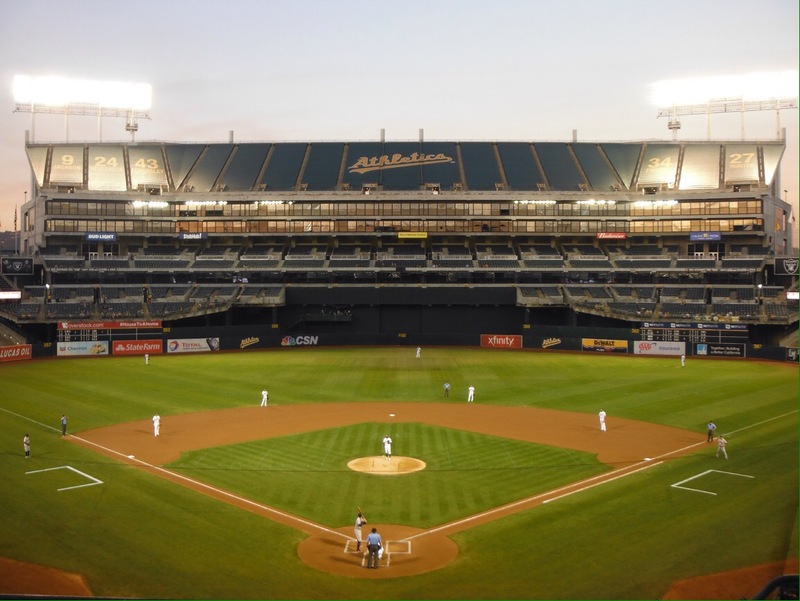 We had managed to go the whole last five and a half months without going to an American sports fixture so took the opportunity to watch some baseball over in Oakland. It was a Monday night at the end of the season so there was hardly anyone there but it meant we got good cheap tickets. The teams repaid the low crowd with a low score (4-2 loss) and it was difficult to stay awake for the whole match, but we managed. My tv-influenced image of drinking beer and eating pretzels while watching the game was shattered when we saw the prices – $11.50 for a beer (not even an English sized pint), so currently about £9. How do people afford to get drunk there? Despite the low score it was fun to experience a true American Sporting Spectacle. 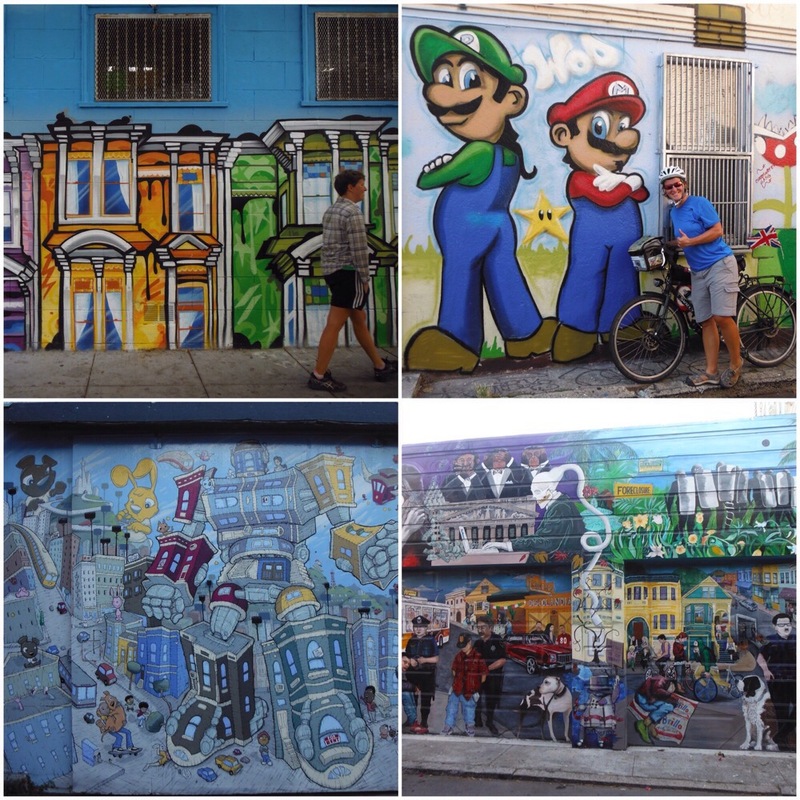 San Francisco is a cool city, no doubt about it, but walking around you also can’t help but see it’s ugly side – the high level of homelessness. We walked through streets where the sidewalk was lined with tents and people sleeping rough, and along with this comes sanitation issues. Trash/rubbish covered these streets and as you can imagine when people live in tents with no toilet, it didn’t smell great. Homelessness has been very visible as we have ridden down the west coast, more so than any developed country I’ve ever been to, but in San Francisco the gap between the rich and the poor appears to be bigger. Homeless people sit outside expensive whole food shops and cafes, and the tech money pouring into the city is evident in the miles of shiny apartment blocks we rode past on our way out of the city. Our hosts explained that affordable housing is little more than a dream concept and the gentrification of neighbourhoods is driving people out of the city or onto the streets. All of this gave us much food for thought whilst riding out of the city in our own strange situation of self-selected, temporary homelessness. Thanks to Katie; Allison, Ryan and Arwen; the yard sale ladies of Arcata; Judy; Mark; and Ruth and Edward.